Shah Razen Said (kneeling) celebrates after scoring. 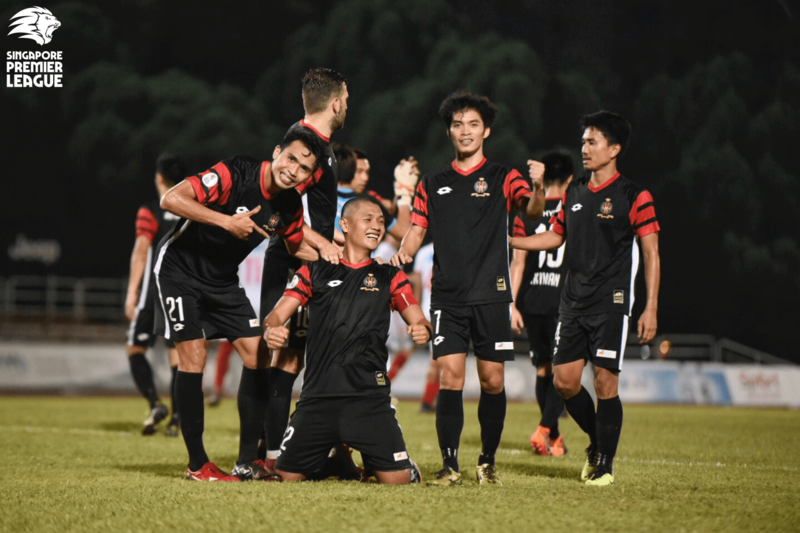 SINGAPORE, 3 OCT 2018 – Two late goals from Brunei DPMM FC saw them make the RHB Singapore Cup final with a 4-2 win on aggregate at the expense of Balestier Khalsa FC, following a 2-2 draw in the semi-final second leg on Wednesday evening at the Toa Payoh Stadium. Hazzuwan Halim and Huzaifah Aziz had helped the Tigers to draw level on aggregate with first-half goals, but the visitors came roaring back after the break with Shah Razen Said and Volodymyr Priyomov each netting once. The hosts started with aplomb and created enough chances to score thrice in the opening ten minutes, but Vedran Mesec was denied by a great reflex save from Haimie Nyaring and Keegan Linderboom hit the bar with a header. A wonderful delivery from Ahmad Syahir then found Hazzuwan unmarked inside the box, but the winger somehow put his header wide. But the Tigers’ pressure eventually paid off when Hazzuwan earned a penalty, which he duly dispatched with ease to reduce the deficit on 37 minutes. It got better four minutes later, with Hazzuwan involved in the thick of action once again. A one-two between Huzaifah and Hazzuwan allowed the former to bear down on goal before slotting the ball past Haimie to put Balestier level in the tie. DPMM tried to impose themselves in the second half and Priyomov came close early on, before Azwan Ali forced Zaiful Nizam into a decent save and Adi Said blasted a free-kick narrowly over. The hosts caved in the 78th minute when Shah Razen smacked the ball in after Brian McLean’s header came off the bar. It all went pear-shaped five minutes later after a lapse in the Balestier defence let DPMM in again. A high ball was not dealt with properly by Shaqi Sulaiman and Azwan Ali managed to nick it before getting a shot away. The ball took a deflection off Zaiful and Shaqi before falling kindly for Priyomov, who tapped it into an empty net for his 21st goal of the season. DPMM will take on Singapore Premier League champions Albirex Niigata FC (S) in the Cup final on Saturday after the Japanese side defeated Home United FC to win the other semi-final tie 4-2 on aggregate, while Balestier will take on Home in the third/fourth-placing match earlier on the same day. Balestier Head Coach Marko Kraljevic: “Nothing happened (for them) until the 79th minute. Everything was okay but in this kind of tempo, you cannot last the whole game. We started losing the shape, but they didn’t create much chances against us as well. One set-piece killed us at 2-1, we tried pushing for another goal and then we conceded once more and the game was over. DPMM Head Coach Rene Weber: “I was very sad about our team in the first half as we don’t usually play that way. In the second half, we turned it around because… they believed in themselves and what they can do. We (also) had a better strategy in the second half. Balestier: Zaiful Nizam (GK)(C), Fadli Kamis, Shaqi Sulaiman (Akbar Shah Zainudeen 88′), Khalili Khalif, Nurullah Hussein, Hazzuwan Halim, Huzaifah Aziz, Fariz Faizal (Afiq Salman Tan 73′), Ahmad Syahir, Keegan Linderboom, Vedran Mesec. Unused subs: Hafiz Ahmad (GK), Nazri Sabri (GK), Nurisham Jupri, Sufianto Salleh, Noor Akid Nordin. DPMM: Haimie Nyaring (GK), Brian McLean, Azwan Saleh (Nurikhwan Othman 34′), Azwan Ali Rahman, Hendra Azam, Volodymyr Priyomov, Suhaimi Sulau (Najib Tarif 71′), Helmi Zembin, Adi Said (Shafie Efenddy 64′), Abdul Aziz Tamit, Shah Razen Said (C). Unused subs: Wardun Yussof (GK), Abdul Azizi Rahman, Abdul Hariz Herman, Hanif Hamir.